General Discussion / Re: Want to see me unpack a few new Washburns at my shop? I've been looking forward to getting one. The look extremely comfortable. I'm a very small dealer in a small east Texas town. If I could stock one of everything here I would! 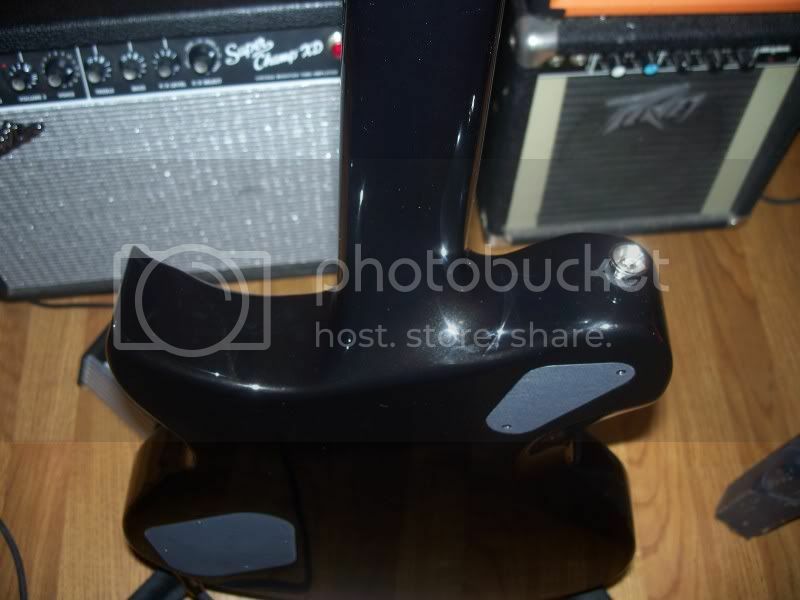 Idol Series / Re: WI-66PRO Idol - Bought Used, Need Info! I have a 66pro with emgs. You got a STEAL on that guitar. AMAZING deal. If it was a Korean model, you got a killer guitar for next to nothing. I'm jealous. Haha Sorry Dude. It was from a store that went out of business. One of the investors/owners had left over gear taking up space in their office building that they were selling on craigslist. It was $250 because it had a small chip in the finish. They had another for $500.00 (which was also a steal) with no flaws at all. I was definitely lucky to be checking out craigslist that day. I joined this forum just to jump in on this discussion. 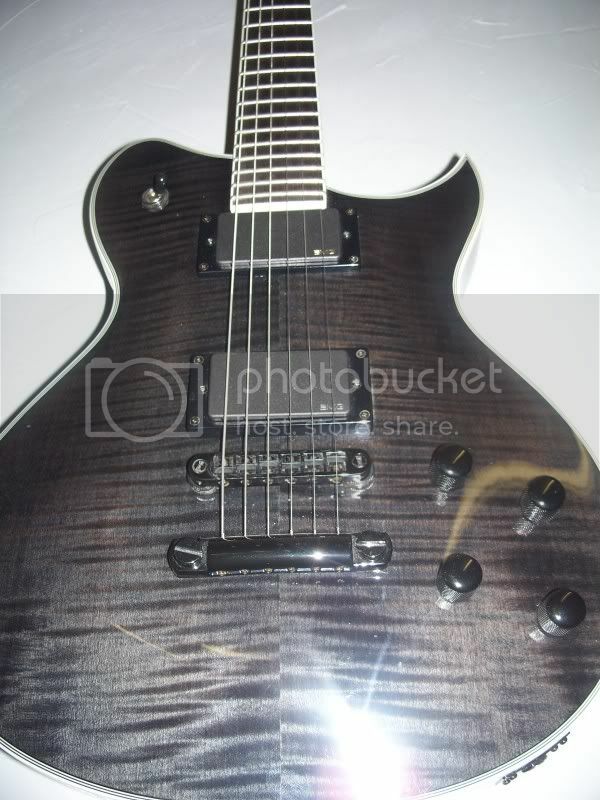 It is upsetting that Washburn has discontinued the old idols. I have a Pilsen Idol, one of the ugly brown ones. 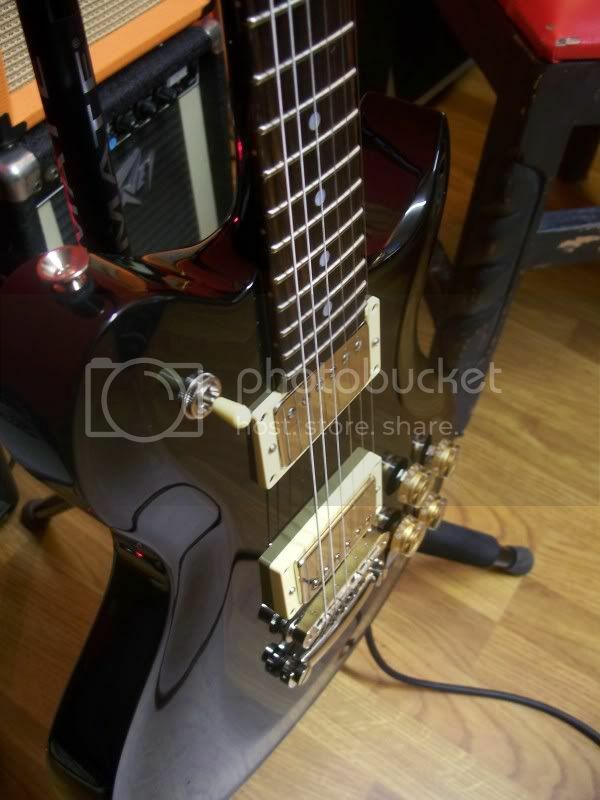 I swapped off the black pickup rings for cream, and the block knobs for gold, and now it has that "black beauty" look. I call it the African Queen! I also swapped out the original Seymour Duncan '59 pickups, which I found lacking, for a pair of Dimarzio PAF's. The Dimarzios are the same price range as the Duncans, but they sound worlds better in this guitar. We did a side by side test, and my Pilsen sounded almost exactly like my friend's $3000 Gibson Les Paul custom shop R8 (1958 reissue). Not only does it sound unbelievably good, but the guitar is fantastic to play. It surprises me every time I pick it up. That's all to say that those old US-made, custom shop Idols were the real deal. You have the Root Beer Pilsen? I have a black USA Pilsen. It's a GREAT guitar. The thick body Original Idols were BEASTLY. Water at a gig is not as important as water 24 hours before the gig and all day leading up to performing. I'm sure everyone does know that anything you drink doesn't actually physically come into contact with your vocal chords as they are located in the trachea and not the esophagus. Acoustic Guitar Players Post Comments & Questions / Re: Man Cave/Guitar Room Tips, essentials, etc. Because most girls want to be romanced.......................in a basement. Show Us Your Washburn / Re: Wi66pro and BSG ELite. I love the Idols I have. Always keeping an eye open on Ebay and craigslist. Too bad they don't make electric guitars of this quality anymore. First it was a slap in the face to all the guys who loved and owned the Original Idols to release another body shape with the same name as what we already owned. Classic marketing failure, of which Washburn struggles with. It would have been a bit nicer if they would have called it something else. As well as continue to offer the original in it's original form and quality like the Korean WI66pro. What if Gibson released a guitar called "The Explorer" that did not look like the old explorer that all us explorer owners have and love............AND decided to discontinue the 1st Explorer shape? Not only that, they also cut back on the quality of the components to make them more affordable?You don't think there would be backlash? Or Fender killing the Strat.....and offering a different shaped guitar, and calling it a strat? Show Us Your Washburn / Re: My Washburns.... updated. NICE! Those were some nice runs of 333s from Boogiestreet Guitars. Wish Eric could get some more. General Discussion / Re: USA custom shop IDOL production ? You can find some great deals out there. One problem with Washburn is the resale value doesn't really hold up on a new one. That's great news to people like me who are fine with buying used guitars. The quality of their Custom shop guitars is KILLLER, and because of their marketing and branding challenges, you can get a guitar that is on par with a NICE Gibson or PRS for a fraction of the cost if you go used. I picked up a USA Pilsen for $250 on craigslist. I think it originally sold street price around 900.00 or so, and retailed for 1300ish if I recall. Here's the USA Pilsen I scored awhile back for a steal of a price. I think you misread my post. The Winpro and the "original" shape produced side by side with them during the last 2 years is the same construction quality. The wi66, wi45, wi64 etc have not been produced in the last 2 years. I did say the originals that were produced earlier than the last 2 years are far superior. Sorry mate,I was actually agreeing with you. Something lost in translation I think. It's all good Irish! We are on the same page my friend. I would love to get my hands on a WI45. Killer guitars. You will have to score the USA's used. The custom shop and USA line is busy with Nuno and Paul Stanley guitars. 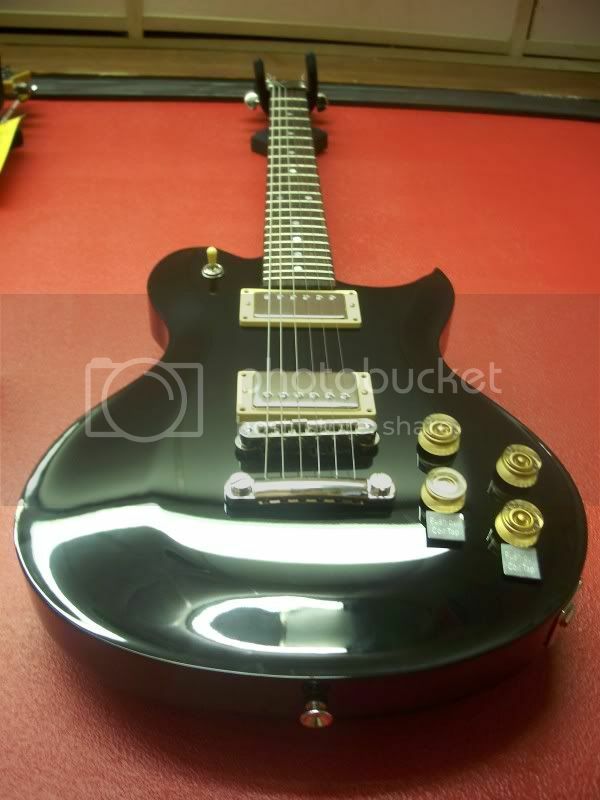 the USA Idols are every bit as good(better) than most Gibsons and definitely the Custom Shop ones are amazing, especially for the price you can get them second hand now. From what i hear they will not even do one off custom shop orders either.